The Portuguese man-of-war is a floating hydrozoan colony consisting of 4 types of polyps. The pneumatophore functions as the float, dactylozooids function as tentacles, gastrozooids function as feeding zooids, and gonozooids produce gametes for reproduction. The Portuguese man-of-war has two types of stinging cnidocyte cells used to obtain food with the help of the tentacles. Food sources usually consist of fish fry and small adult fish as well as small crustaceans. Sensory cells are numerous and located in the epidermis of the tentacles and the region around the mouth. Movement of the Portuguese man-of-war is done passively with the aid of its gas-filled float. The reproduction of the Portuguese man-of-war is based on the colony of unisexual organisms, with each individual having specific gonozooids. The Portuguese man-of-war has a geographic range from the Atlantic Ocean, Pacific Ocean, Caribbean, and Sargasso Sea. It floats on the surface of tropical marine waters. In areas of high tourism, the Portuguese man-of-war can be especially harmful to humans due to its powerful neurotoxin. Much money is spent year-to-year in order to treat swimmers who are stung by individuals that have washed up on beaches. A substantial inflammatory response is the primary symptom of a Portuguese man-of-war sting. Kurlansky, Mindy B. "Physalia physalis". Animal Diversity Web. 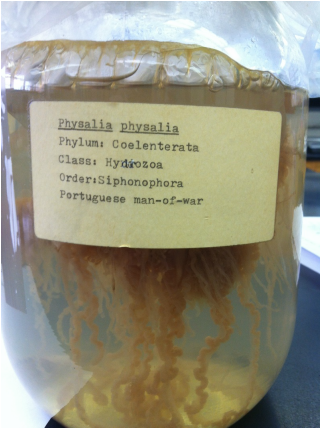 Retrieved from: http://animaldiversity.ummz.umich.edu/accounts/Physalia_physalis/.